Its founders Scott Leonard and Matt Reynolds have been in the business since 1994 and have been using a whole lot of organic fibers such as organic cotton, Merino wool, silk and Alpaca, with the silk obtained from a safe extraction process that doesn’t harm the silkworm. They use natural dyes which are free from chemical toxins and pollution linked manufacturing processes. All their yarns and dyeing processes are compliant with Global Organic Textile standards (GOTS) and they ensure that all their associated mills are run and managed in an environmentally safe manner. Indigenous is located in Santa Rosa California. You can purchasetheir products from their online store at the below link and can also check their latest collections. The store offers a whole lot of vibrant clothing for men and women apart from a separate category for products on sale or for new additions. You can also purchase accessories such as scarves and can also look for their gift choices. They also offer free shipping for all online orders by FedEx ground. Women can choose from cardigans, sweaters, dresses, tees, blouses and many more. Men can choose from a whole lot of shirts and sweaters in various colors and size. 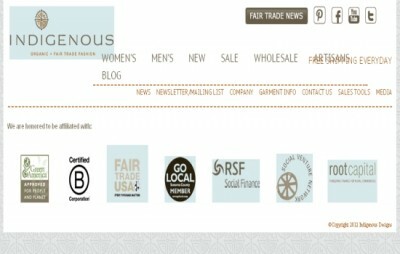 This s one store you need to check out if you are looking for some amazing designs usingsustainable materials.